YouNeverCall, the popular online cell phone retailer (see: http://www.younevercall.com) announces that its Second Life Cell Phone Technology now includes the ability to send Text Messages (SMS) to Real World Cell Phones. 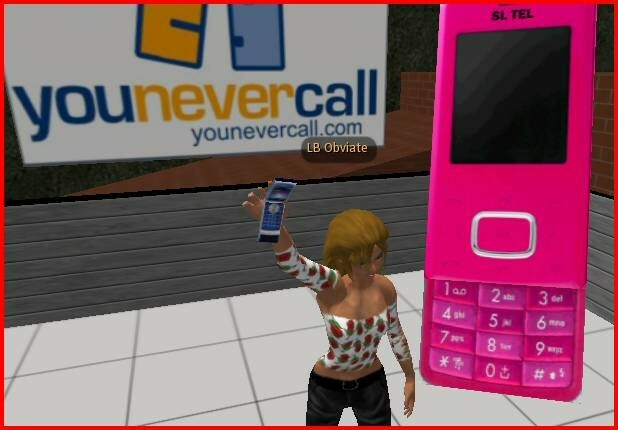 YouNeverCall also announces it has joined forces with SL TEL to provide its technology to a range of popular cell phone models offered by SL TEL through its Second Life stores. 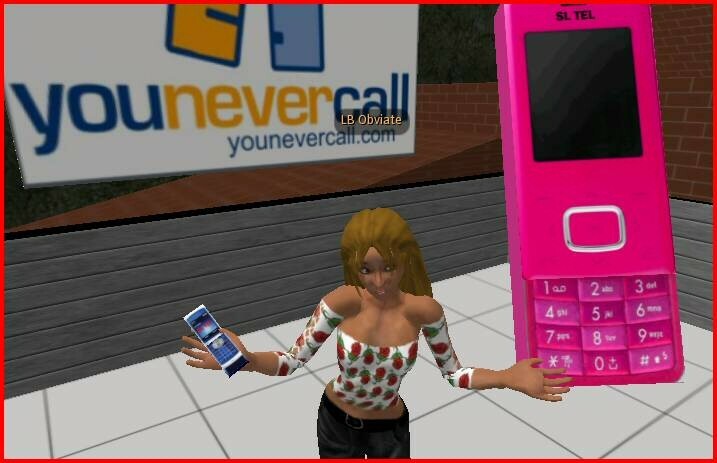 YouNeverCall (http://www.younevercall.com) has joined forces with SL TEL to bring the YouNeverCall virtual, Second Life cell phone to the next level. With the introduction of real-time communication between handsets in a way similar to SMS and providing a range of useful information services in-world, these new phones look strikingly similar to popular models from well-known real world manufacturers, and can be used to send actual SMS messages to the real world. Second Life retail establishment, SL TEL, sells a range of phone handsets that closely resemble real-life models and with YouNeverCall's technology inside, can now be used to send SMS messages to real cell phones in the US, Canada and UK with more coverage coming soon! The cost for sending real world SMS messages is currently set at L$25 (25 Linden dollars). Designed for fashion-conscious Second Life users to accessorize their avatar with stylish, life-like mobile phones, these accessories are perfect to be seen with when out and about. They look and feel as close to real models as possible with working flips/slide out keypads and containing a lifelike animation to allow the user to appear to be speaking on the phone when in use. Available in a range of looks and colors that reflect their style and functionality, they are offered at a price that makes them attainable for most residents. They can be found at a number of locations across Second Life, with the main store locations at Chamonix 134/239/66 (http://slurl.com/secondlife/Chamonix/134/239/66/) and Chicagon 157/67/106 (http://slurl.com/secondlife/Chicagon/157/67/106/). Multiple SL TEL phones can be used on a single YouNeverCall phone ID number, so users can change their style as often as they like. As a rapidly growing community, Second Life presents great potential for new development and as boundaries between the real and virtual become ever more blurred, the ability for users to communicate in new and innovative ways becomes ever more important. According to Al Trumbo, CEO of SL TEL, "The partnership that formed between SL TEL and YouNeverCall was natural. We've enhanced the services available to Second Life users by leveraging YouNeverCall's experience in real world cell phone business operations. Plus, we can now provide users with new services such as the ability to send SMS messages from virtual handsets to phones in the real world, and real-time information delivery to their handset. I see this as a fantastic opportunity - two great products have joined together to give Second Life users a whole new level of style and functionality in the way they communicate." YouNeverCall's best-selling cell phones in their real-life, online cell phone store have been the Motorola RAZR V3, SLVR and the LG Chocolate to name a few. "That's why it was so natural for us to team up with SL TEL," said Sam Michelson, CEO of YouNeverCall, "as they have developed virtual phones that were inspired by the same, popular Motorola, Nokia, LG and other top-brand cell phones. There are some differences, of course. These are the first cell phones to work under water and are even legal to use while flying. I'm sure that our customers will enjoy having a cell phone that has no dead zones or dropped calls! We look forward to continuing to expand the functionality and personalization of these virtual accessories, with ringtones high on the list." YouNeverCall was launched in 2003 to provide great communication solutions with 'extreme customer service'. At over 250,000 monthly visitors, YouNeverCall's online cell phone stores offer over 100 models of the latest cell phones for Cingular, Verizon, T-Mobile, Sprint and Nextel. 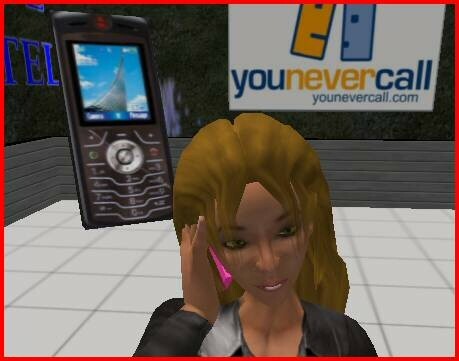 YouNeverCall also offers cell phone shopping assistance around the clock via phone and chat. To experience YouNeverCall for yourself, go to http://www.younevercall.com. SL TEL runs an established chain of retail locations across Second Life and is expanding rapidly. SL TEL phones are available from main store locations in Chamonix 134/239/66 and Chicagon 157/67/106 and from a growing network of smaller outlets in malls throughout Second Life. SL TEL has been operating in Second Life for the past six months and has been a steadily growing business. SL TEL is a sister company to ACC Vehicles, creator of some of the best vehicles in Second Life. New Second Life phones - Stylish and UsefulYouNeverCall offers usefula nd stylish cell phones for Second Life - Partnership with SL Tel Announced! 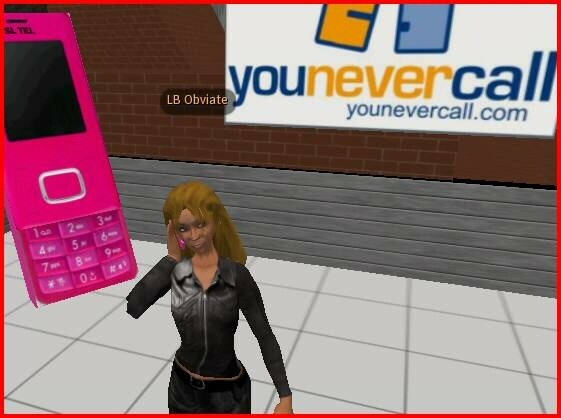 YouNeverCall Second Live Cell Phones - CoolSL TEL and YouNeverCall team up to introduce useful and stylish cell phones for Second Life! Cell Phones for Second Life - Cool and UsefulSL TEL and YouNeverCall - partnering to create cell phons for Second Lifers SL TEL - Useful Cell Phones that Look Great!YouNeverCall and SL TEL offer cool and useful new cell phones!